Whether it be a hoax, a fabrication, or just somebody's imagination of some sort, Grandpa Hun Sen, the facebook emperor of Cambodia, is very very nervous here just as more than a few political analysts recently hinted that Grandpa Hun Sen has no intention of going anywhere but ruling Cambodia until the bitter end...I wish you nothing but the best of everything in life Grandpa HUN! Ah Kantorb and its puppet just created a "theater" to divert the people's attention from Kem Ley's death. 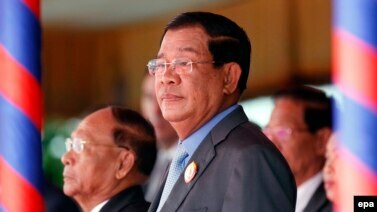 By now, we should know Ah Yuon's trick and Ah Kouk Hun Sen's determination to serve his master Yuon. Ah Chor Pnek Muoy Hun Sen !! You have hurt Khmer people and harm Cambodia so so much !! Coup d'Etat Porng Kdor Ah Hun Sen.
Ah Hun Sen will try to add that there are some CNRP's members in that Porng Kdor coup d'Etat. Have you ever seen a coup d'Etat on facebook before? This is so stupid funny . Ah Hun Sen Chkuot Mern Tern Heuy !!!! !